Solve griddlers that come alive and shine with bright colors. "I just loved Picross Bonbon: Nonograms. Nonograms are fantastic fun, especially if you like to use a little logic. More of this type of game please." Judith, the charming owner of a small sweet van, and her loyal assistant Toby are planning a round-the-world journey. No challenge is too great for these two. They will drive their van up the tallest mountains, into the deepest canyons, cross oceans and see the most wonderful treats of the world. 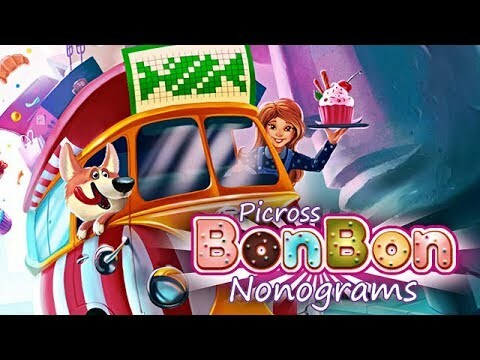 Picross Bonbon: Nonograms is an exciting intellectual game that fans of griddlers, puzzles, sweets and adventures are sure to love. Watch as level after level, the griddlers you complete come alive and shine with bright colors. See the wonderful sights of the planet, countries and the desserts they're famous for. Explore the world and discover new, unseen recipes for sweet treats in Picross Bonbon: Nonograms.